At februari 5 and 9, 2012, two strange discoveries where made in Schijndel and Arnhem , the Netherlands. 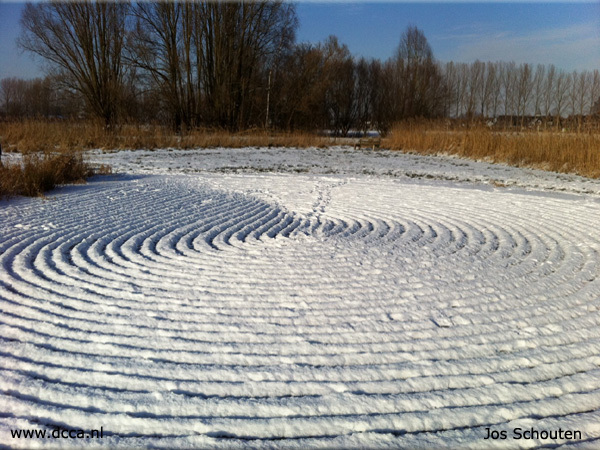 In Schijndel a formation in snow was discovered at a private pond. This formation looks if someone used a huge rake to make this beautiful pattern. 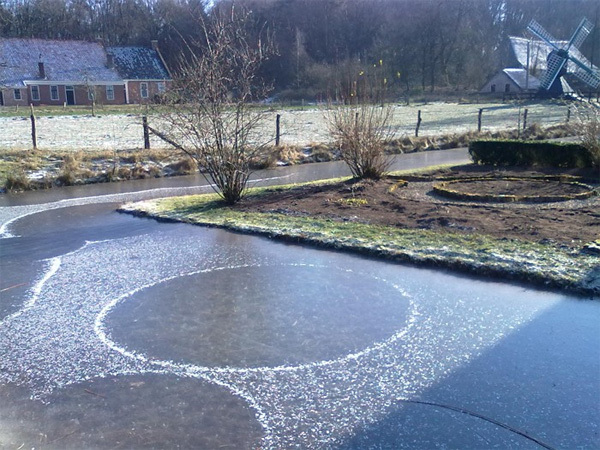 At the Netherlands Open Air Museum in Arnhem some circles on ice were found. At februari 10, a Dutch radio program paid attention to these amazing circles and DCCA researcher Peter Vanlaerhoven was asked to give some comments at the circles. There was a lot of laughing at the radio and of course nobody could do anything with Peter’s explanation that certain energetic frequencies can cause a crop/ice/snow circles. A lady from the Open Air Museum explained a theory which se had heard recently: the sound of a tractor causes vibrations in the ice with the circles as result. Plausible or nonsence, because in Schijndel no tractor or other machines were in the neighbourhood. So let us have a better look at the ‘tractor-theory’. Both patterns on the metal plate look the same as the two circles in Arnhem and Schijndel. 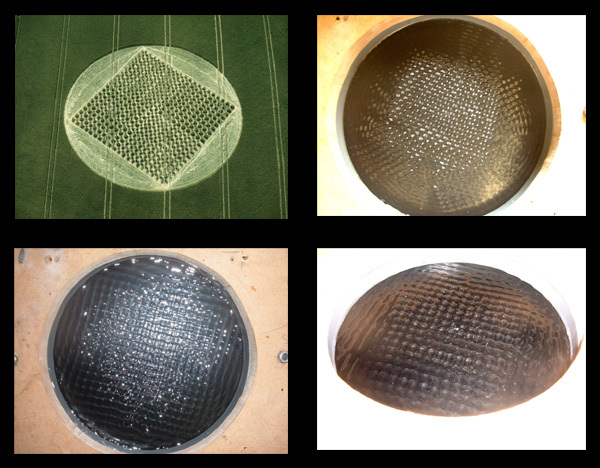 Could it be that these circles on ice were created by some kind of sound and if so, don’t we have to adapt a new theory that crop circles are created by sound? This because mother earth is making more and more sound like earthquakes and strange sounds in the sky. The earth is moving and making noise, that makes you think. 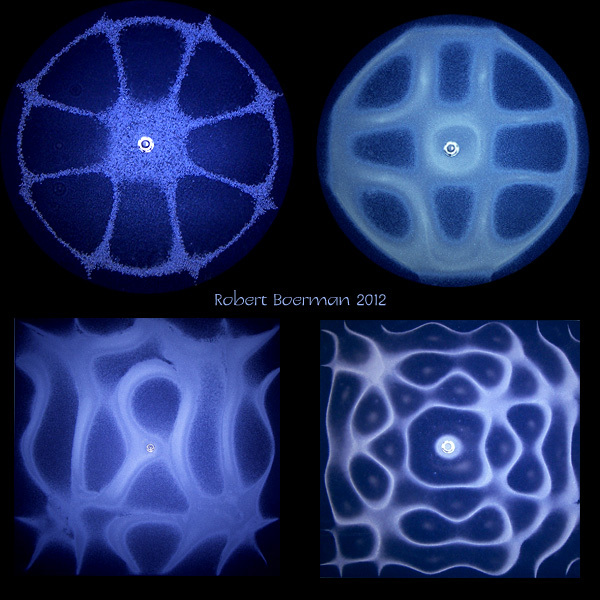 My experiments with cymatics show that a vibration can cause a geometric pattern in water or sand/salt, the same geometry as we find in crop circles. It was in 1997 when I discovered a crop circle close near my house. That was the start of a search to an explanation how crop circles are created. One of the first articles I read about crop circles was Freddy Silva’s article: Is sound creating crop circles?’ I remember the moment I was reading this article and said to myself: ‘Yes, this is it’, but after that I needed 14 more years to write down my findings which I have done during my crop circle research and to found the theory that crop circles are created by sound. 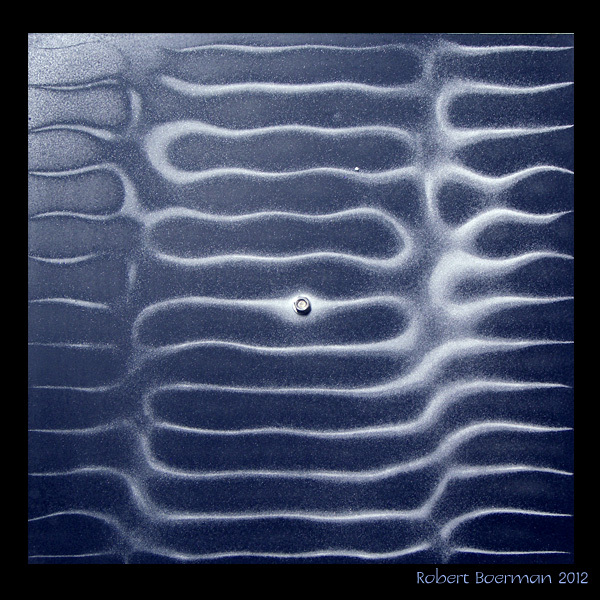 In ‘De Grap van de Graancirkel’ I wrote down all the crop circle research I did and soon it will be published in English. It was the ‘tractor-theory’ that made me look in my photo archive to see if I could find similar cymatic patterns as the snow- and ice circles in Arnhem and Schijndel that could support this theory. My cymatic research project shows that it is possible that sound can create geometric patterns, but if a tractor was responsible to create the ice circle in Arnhem, I am not sure about that. But to me I think it is possible that the ice reacted like a thin metal plate on which some frequencies (or sound from a tractor?) causes the circles on ice. This is my theory and if you have another one, please let me know. mening.